The last word in range extension – maximum power: The Motorola GR400 UHF repeater. The Motorola GR400 repeater is the right choice for those times when you need to reach a bit further. The Motorola GR400 is ideal for transmitting strong, wide-ranging radio signals over large areas like fairgrounds, large outdoor-event venues or heavily constructed sites. A Motorola GR400 system has two channels: one for receiving, and the other for transmitting signals. Therefore, one system is needed for each radio channel. Multiple GR400s can be connected into a "chain," allowing a radio signal to be transmitted further and further. 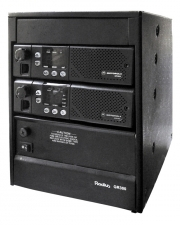 Compared to our Motorola repeaters(like Motorola DR3000 or Motorola SLR5500), though, their analogue technology severely limits the number of GR400 repeaters that can be used in this relay system. Please note that, in Germany, the fee for a frequency is payable to the Bundesnetzagentur (German Federal Network Agency); the fee for up to 30 days of use is an additional €130.00 (net). This fee will be added to the repeater rental rate as a one-time charge. We apply for and administer the frequency at no extra charge (i.e. these services are included in the daily rental rate). Of course, our service team also services and tests every GR400 system for full functionality before each use. If you wish, we can also provide a local technician to install repeater systems and brief you on the operation of the GR400 on-site. Looking to rent Motorola two-way radios, and maximise your range by using one or more Motorola repeaters? We'll gather all the information we need for your quote in three simple steps. Or call us toll-free at 0800.11.88.44.00. You can also reach us by e-mail at mail@Radio-Rental.com. We're looking forward to hearing from you, and we'll be happy to advise you. We rent various versions of Motorola repeaters, including 19" models; the picture above should be considered an example only.